The detritus of urban life has long provided material solutions for artists; in Yuken Teruya’s work, the discarded becomes the site of poetic transformation. 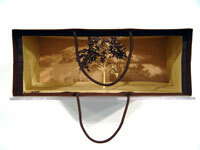 Shopping bags – in some ways the emblematic item of rampant consumerism, one-use receptacles quickly ditched – are placed within the gallery at a ninety-degree angle, their ends to the wall, becoming peepholes for one viewer at a time. 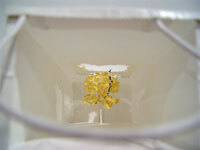 Their dark interiors are speckled with light from holes cut into the bag’s paper surface; the shape of the hole is that of a full-grown tree, so the bag becomes both stage (with its own lighting) and source of imagery. 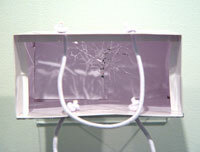 Stooping to encounter each work, the viewer is obliged to reimagine the nature of the receptacle: it’s changed from a passive to an active space. 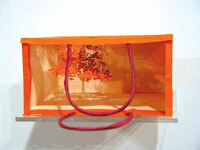 Each tree is painstakingly cut, its leaves and branches described with exceptional care, and each bag derives from a slightly different source (sometimes highend fashion boutiques, others Mc- Donald’s), which stages the tree’s connection to the natural world in divergent ways. 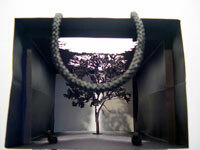 At times, as in Golden Arch Parkway McDonald’s (Brown), the bag’s mellow ochre tones evoke autumnal shades; at others, such as LVMH Mark Jacobs, the black bag lends the tree a doomy and gothic aspect. 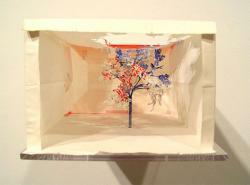 Reversing the flow of industry from tree to paper, Teruya’s work has an environmental sensitivity that’s hard to miss. It’s also a poignant assertion of the role of the creative artist: as someone who finds meaning amid the morass of stuff we leave behind. 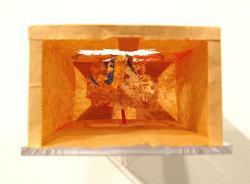 For NoticeForest, Yuken Teruya creates enchanting dioramas within products made from paper such as a take-out bag or the cardboard tube inside a toilet paper role. 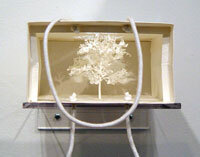 Carving detailed, miniature trees in each, Teruya makes fragile, magical sculptures about nature, craft, and consumerism. Born in Okinawa and now a resident of New York, Yuken Teruya approaches each of his projects with a keen sense of the environments in which he lives. His work often traces the link from nature to consumerism, as well as actively borrowing from both traditional and contemporary sources in his works. Yuken Teruya was born 1973 in Okinawa and is presently working in New York. His homeland lies in the south of Japan and is made up of many small islands. A general map of Japan usually doesnﾕt even show the Okinawa island group. 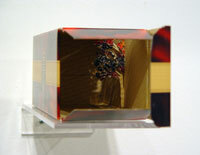 Yuken Teruya was selected as the recipient of the Aldrich Emerging Artist Award for 2002 by the curatorial staff of the Museum. This Award is given to an artist whose work exhibits bold innovation, exciting originality, clear direction, and serious dedication. 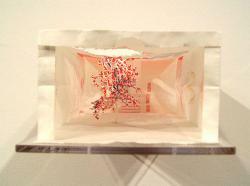 As the 2002 recipient, Teruya exhibited his work in his first solo exhibition.